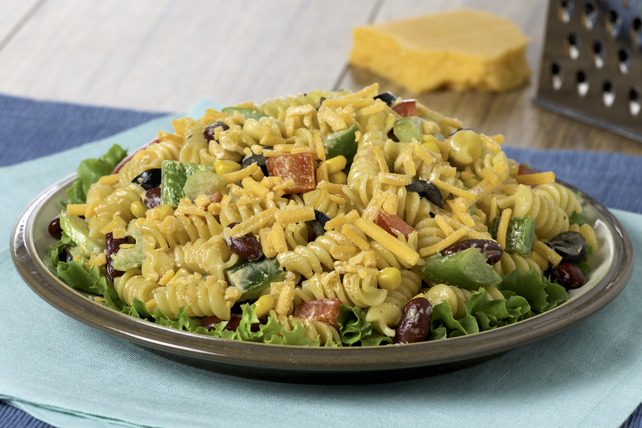 A tasty pasta salad inspired by the flavours of the American Southwest. Whisk dip and taco seasoning mix until blended. Combine all remaining ingredients except cheese in large bowl. Add dip mixture; mix lightly. Serve on lettuce leaf-covered plates. This colourful pasta salad can be prepared ahead of time. Refrigerate up to 2 hours. Top with cheese just before serving.